Antidepressants are a difficult subject, one often skimmed over and generalised in the mainstream press and society. The stigma that surrounds mental health doesn't help, nor does the fact that antidepressants can affect patients differently for a whole host of reasons. One of the biggest stumbling blocks, though, is the lack of faith in them from certain areas of the medical profession. For the first time, a large-scale research project has confirmed that antidepressants do work when prescribed to patients with severe depression. In reaction, I spoke about this last Thursday via Twitter, and also the following day in the Daily Mail. 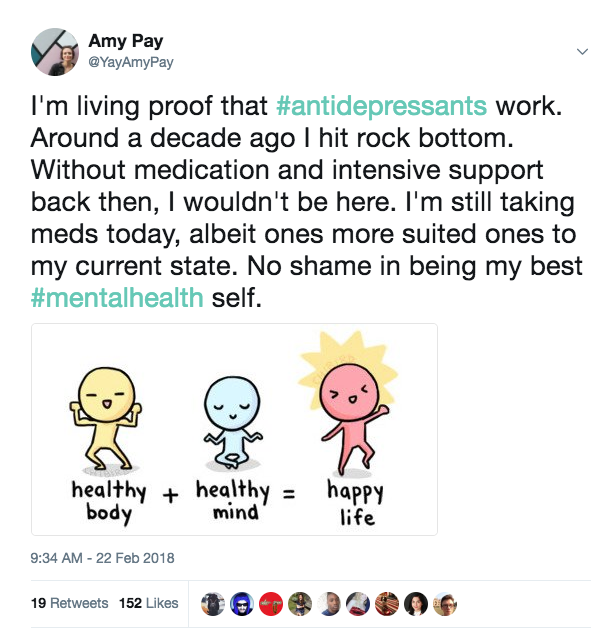 Antidepressants saved my life - not single-handedly, but they were a major part in my survival from severe depression, OCD and anxiety. I don't want people to think that antidepressants alone are the answer to complex mental health conditions, but from my personal experiences I can say that I found them to be a helping hand when trying to engage with other mental health support services. Before I took them back in 2009, I wasn't able to concentrate, I couldn't think clearly and I certainly couldn't take in information that psychologists were telling me. The tablets cleared some of the fog and stopped my thoughts from racing so fast that they knotted themselves up. What matters, though, is that people know it is okay to seek help if you're feeling unwell - be it for your physical or mental health. Antidepressants aren't for everyone, and finding the right ones for you can be a case of trial and teary error, but if they lead to you being able to get your head straight and rediscover your true self, then I think it's worth the battle.